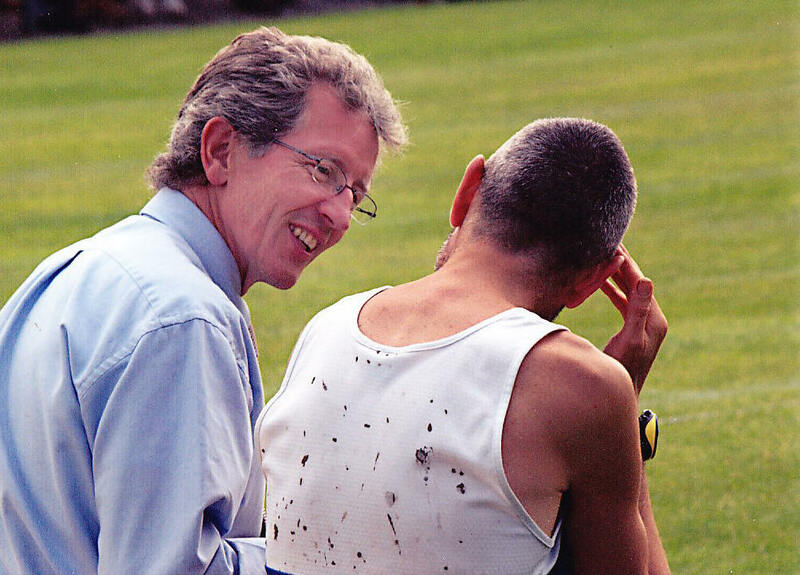 Graham Crawford is one of Scotland’s best respected athletes – respected as a person but also highly respected as a runner and class performer. On the road, over the country and on the track, he was an excellent competitor. 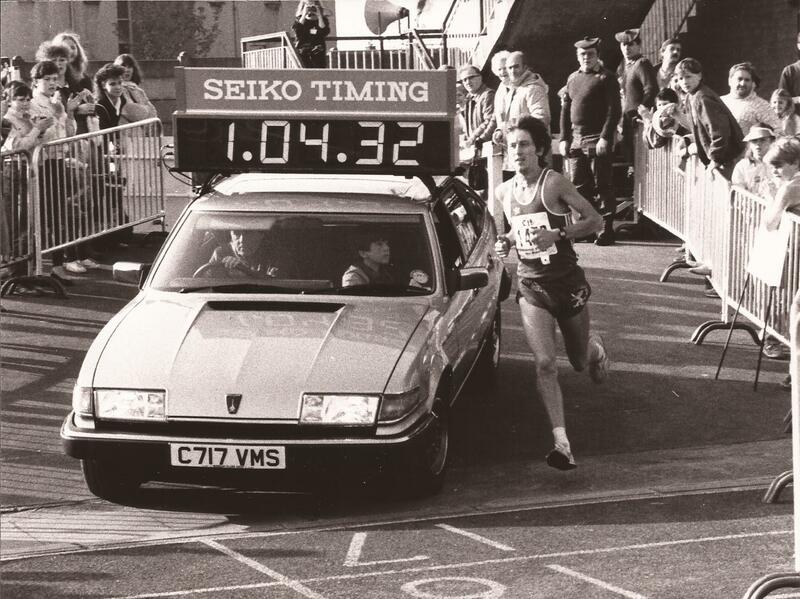 Look at some of his series of victories on the surfaces – three Jimmy Flockhart wins over the country, winning the Strathallan 1500 four times and the 3000m six, and of course for the half-marathon distance – don’t even go there!. 13 half-marathon wins in one year (ie 13 x 13) and a very good run in the Sun Life stage race from Glasgow to London. When in form, he gave no one an easy time in a race. There is a story of Ian Stewart, after being beaten by Harald Norpoth in a hard battle of a race lying on the track and asking for the TV microphone: he then said to Harald through the TV screen, in a very tight close up, that “that was a bloody hard race Harald, and next time you’ll get more of the same!” That could well have been Graham Crawford’s thinking after a defeat. But, as we will see below, he was just as hard on himself in training and that was maybe what made him so hard in the race situation. I asked him to complete the questionnaire but we just passed on that and asked the professional journalist to share his own memories of his career. You’ll agree that it makes for a fascinating read and insight into the career of a very good athlete indeed. Graham Crawford. DOB. October 5, 1956. Occupation journalist. Club Springburn Harriers, briefly Wolverhampton and Bilston second claim. PBs – 800m – 1.58.4; 1,500m – 3.50; 3,000m – 8.10; 5,000m – 14.10; 10mile – 48.48; 10.3 mile – 49.19; half marathon – 63.46. Ran for Scotland on track, road and cross country. Represented GB at half marathon. I played football constantly as a youngster and ran everywhere. I loved being outdoors, being physical. I remember doing impromptu longish distance running races with a few pals when I was 10 and 11 years old. In my teens I did paper rounds and milk rounds, and PE was the only lesson I looked forward to at secondary school. My heart would soar, while everyone else moaned, on days the PE teacher said we were doing a cross country run. Not long after starting Bishopbriggs High I heard about ‘novice races’ being held by Springburn Harriers aimed at all the local secondaries including St Ninian’s in Kirkintilloch and Lenzie Academy. I ran my heart out over a mile and a quarter, finished about 5th, and was hooked. Old Jack Crawford (whom the club’s annual road race is named after) invited those interested to come along to the Springburn club nights, based at the old wooden hut at the bottom of Auchinairn Road, Bishopbriggs. I quickly found out that the club had a long history of producing top young runners, including former world junior cross country champion Eddie Knox. OId Jack offered support in the early track and road races, meticulously recording our times. I was small and skinny for my age, and was greatly encouraged when I made the Bishopbriggs High team, running against boys up to two years older, for the Lanarkshire Schools (at muddy, challenging Cleland) and Scottish Schools. Initially I tended to train autumn to spring in those days, and was delighted to be the fourth counter for a Springburn senior boys team which took second at the national cross country. A few years on, as a second year youth, I got serious about training. The club coach was Eddie Sinclair (best known for his success with miling great Graham Williamson) but he and my clubmates were Kirkintilloch and Lenzie based, so I did my own thing. I remember doing a basic winter diet of 20-25 one-minute hill reps on Monday, Wednesdays and Fridays (I felt I lived on that hill by a Friday), a long run on a Sunday and steady sustained runs of around 55mins on other days. I backed off the hills a few weeks before the Scottish National at Drumpellier Park, Coatbridge, and did a few fast rep sessions with spikes on grass. To my delight, I finished fourth behind John Graham and Nat Muir. Not far behind me were the likes of Hammy Cox, Eddie Stewart and Graham Laing. I also led my Springburn teammates to the team prize, and that meant a lot to me. The club subsequently went down to the English National (at Luton?) with high hopes of a successful cross-border raid, especially as our top junior Jim Lawson was eligible to join us as a youth in England, but we all thought we ran below our best. Even though we still managed second of 93 teams, a fine achievement, we were deflated. We felt we could have won. I experienced a bigger disappointment at the Scottish Schools cross country championship. With John Graham and Nat Muir no longer at school, I was favourite in some eyes to win. However, I was unwell on the day and finished seventh. It was won by my Springburn teammate Tommy Patterson whom I had beaten by 30 seconds two weeks earlier at Drumpellier. Instead, I was a minute behind him. That hurt. I remember having a wee sob to myself later that night. However, with hindsight a lot of young Springburn runners who enjoyed success didn’t handle the transition to being a senior and quit the sport, while my lack of championship success kept a hunger alive. I’ve always missed out on individual championship medals. Four times fourth in the West District cross country is an example. As a junior man, I again trained very hard, clocking 70-80 miles a week on my own. Nat was turning into a world class athlete, so my realistic target I felt was second in the junior National. However, I picked up a bad injury and while I was recuperating I got distracted and involved in a pretty carefree, reckless life. I partied endlessly and didn’t turn a leg for four years, and there was no coach there to say ‘hey, it’s time to get going again – there is always another race, another target’. At the age of 24, having made a pretty good job of messing things up, I was realising I couldn’t go on like that. I caught a UK marathon trial race on the television and in that moment decided it was time to start running again. Six months later, I was a match for anyone at Springburn and within two years was running cross country for Scotland and clocking the second fastest times at the McAndrew and Kilbarchan relays. I was in a hurry, and by then I was being assisted by older clubmate Harry Gorman who was advising me on pace/speed training. I really did appreciate his involvement, and it was a fruitful relationship (he was best man at my wedding. I can remember our shared delight and surprise at my relatively rapid progress on track and road. They were exciting, fun times. 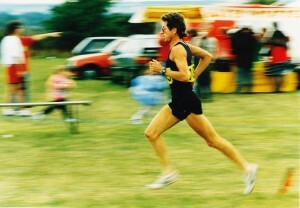 A very one-paced runner was discovering that with application and quality training, he could actually run quite fast. The relationship was eventually marred by my propensity for secret overtraining and we went our separate ways. The culmination was a winter where I averaged 125 weeks for about three months, still doing quality sessions, hill work (up ploughed fields with 1kg weights around each ankle!) and circuit training. It was too much for too long. If I had the least bit of spare energy, I expended it in training. Rest was a four-letter word. After a few disappointing races where I ran flat because of my deep-seated fatigue, I was persuaded by Harry to take six weeks off. That summer, having resumed more sensible training, I set track PBs at most distances. Overtraining was a fairly common Scottish trait and I had it bad. I was very driven. I foolishly wanted to train hard and race well all the year round. I loved doing hard sessions, and loved racing – cross country, road, track, highland games, low key hill races. Dave Bedford was my boyhood hero and as well details of his legendary training, I soaked up everything from the Athletics Weekly about the many top English and Scottish runners in the seventies and eighties. It was always the more extreme trainers I tried to match. Looking back, I can see I lacked real specific targets and structure and that some other Scottish runners and plenty of English runners were clearly better at getting the balance right. While their training was goal-orientated and structured, I was a spontaneous, compulsive, obsessive, runaway train and essentially uncoachable. I once ran 50 races in 14 weeks, and over the years swung from purple patches, when I could control my training excesses, to periods of deep disappointment where my relentless desire to win was never going to be enough to overcome deep fatigue in overtrained and under-rested muscles. Perhaps because I lacked natural pace, I was always overcompensating by trying to be tougher and stronger – endure more. I finally learned the lesson of rest being as important as hard work in 1986, when initially my legs were so shot from a half marathon I had no option but to run easy for a week. And lo and behold, I could go out on the seventh day and run really fast again. It would be difficult to imagine a more surreal and remarkable year – and, as usual, it was not planned. In the space of eight months, I was to run 20 half marathons and win 13 of them as well as win two 15-milers, an extremely fast 10 miler and perform well in many shorter races. It remains quite a unique block of racing I believe. And, I repeat, it was all spontaneous – a fun journey of discovery. My first half marathon experience had been a happy baptism, at Dundee the previous October, which I won in 66.35. Two weeks later, split by the second fastest leg at the West District Cross Country relays, I ran 65.29 to win the Falkirk Half Marathon. I then had a relatively unspectacular winter’s training and racing (and yet another poor national cross country) before clocking a respectable 29.49 for the Kodak 10k starting at Crownpoint, Glasgow, won by Nat Muir in 28.45, two seconds in front of Allister Hutton. 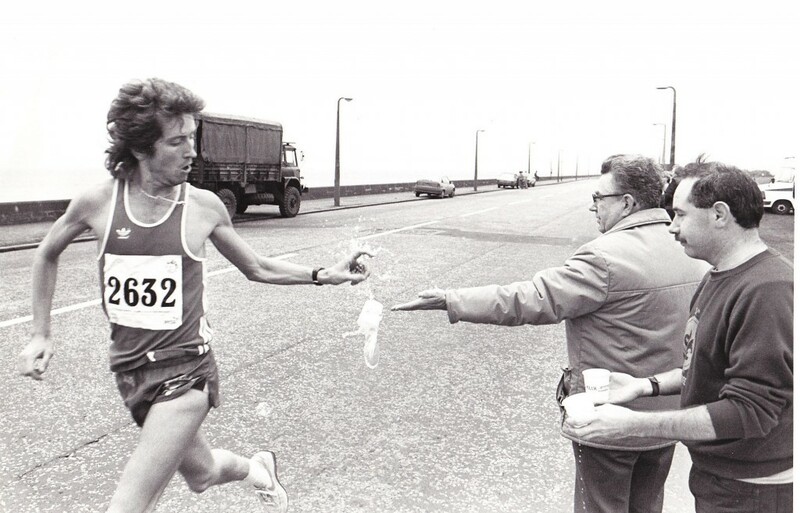 On a windy March 23, 1986 I found myself lining up for the Inverness half marathon. I went off hard with Simon Axon and was soundly beaten by him. I ran 66.35 and he was about a minute faster. Two weeks later – split by a long leg at the six-stage relays – I set a course record winning the Glen Fruin 15 (14.6 miles?) race at Helensburgh in 75.38 just ahead of Bellahouston’s Andy Daly. Two weeks later it was the Jimmy Scott memorial 15 miler at Strathclyde Park where I led home Peter Carton of Shettleston in 78.10. Was I pleased with the run? Yes, it was hilly in parts, windy and I had spent hours moving house earlier that morning! A fortnight later, and four days after a windy 3,000m in 8.38, I had a rare dnf in the Pearl half in Edinburgh won by Neil Tennant in 64.41 on what I thought was a particularly challenging course. It was an exceptional run by Neil. Two days later I won a Sri Chimnoy two-mile race in 9.14 followed by a hilly 10k road win in Dundee in 32.23 four days after that. Eight days on, on May 18, I set off at a blast with Peter Fleming of Bellahouston in the Luddon Half Marathon, Kirkintilloch, clocking 19.05 after an undulating four miles before we hit strong wind. Peter broke the tape in 65.57 with me second in 66.35. Six days later, I was down in Kirkcudbright for another half and fancying my chances. Looking around, I did not see anyone to worry me. From the gun, a lad tore away ahead of me. I was a fast starter in these races, and I remember thinking he must just one of those new, inexperienced guys who get carried away for the first half mile before fading. A few miles later, I was thinking otherwise. We were tramping along, locked into a relentless pace. 19 minutes at four miles INTO a wind and I’m hanging on, repeatedly thinking ‘who the hell is this guy?’, (reminiscent of Butch Cassidy and Sundance Kid wondering who were the indefatigable posse chasing them down at the start of the film). At six miles I remember thinking, ‘if this was a 10k I’ve just had a damn good race’. About a mile up the road, the elastic broke and Mike Carroll of Annan (I eventually discovered his name) went on to clock 63.32 and put nearly a minute between us. It was a class performance. He was a tough, relentless pacer. Later that year he was 30 yards ahead of the pack in the Great North Run after two miles, in a race which Steve Jones and Mike Musyoki clocked under 61 minutes, a world best I think. Carroll ran 64 something, but I remember thinking that if he had screwed the nut early on he could have clocked around 62 and taken some big scalps. A week after Kirkcudbright, during which I sneaked in a windy track session on cinder (3x3x400, averaging 65 secs, with 30 seconds between efforts and a lap between sets), I won a six-mile road race at East Kilbride in 30.52, trying to save something for the Irvine Valley Half Marathon the following day. I won that half in 70.09 and my training diary records it was ‘quite windy and extremely hilly’. Five days of easy recovery runs later, I won a hilly Bearsden Half Marathon in 68.15, with Alasdair Douglas second in 69.54 ahead of Alan Wilson, 72.11, and Alan Adams 72.12. I remember thinking around about then ‘this is good, let’s just roll with it – where can I race next?’ However, that euphoria was punctured eight days later when I struggled to clock just over 70 minutes to finish seventh on a very hot day at the Clydebank Half. I went off fast with Laurie Spence and Peter Fleming, but after a long sustained climb after a few miles I think Laurie and I suffered while Peter proved to be imperious in 64.17 (on a difficult course on a hot day!) Alan Wilson had quick revenge on me in second place, followed by Hammy Cox and Tommy Murray. Undaunted, a week later I won the Lochgilphead Half on a hot and windy day in 70.44, six minutes ahead of the second placer. A week later – split by a midweek 8.20 open graded 3,000m at Meadowbank behind Colin Hume, 8.09, and George Braidwood, 8.12 – I won a hilly and warm Dalry 10k in 30.47 by more than a minute from Kilbarchan’s Gordon Tenney, and then did a fairly hard track session the following day! A week after Dalry, I won a hilly Stonehaven Half Marathon in 71.16, and then, on the following day, took the Knock Hill race at Crieff by a second from Ian Howie in 18.24. Just two days on I ran a windy 3,000m in 8.32 at Grangemouth behind George Braidwood. Four days later, I chanced my battle-weary legs at the Runsport Marathon at Stirling. In ideal conditions on a flat course, I missed the opportunity for a fast time, clocking 65.57 behind a very impressive Peter Fleming, 63.16, Simon Axon, 65.35, and Donnie Bain of Falkirk, 65.40. Six days later, I ran a 1,500 at a windy Crownpoint for sixth in 3.56 behind Nat Muir, 3.52, Braidwood and Robert Fitzsimmons, 3.53. Pleased at the time with the lack of track work, I ran a four-mile relay race leg at Dundee the following day without going flat out. 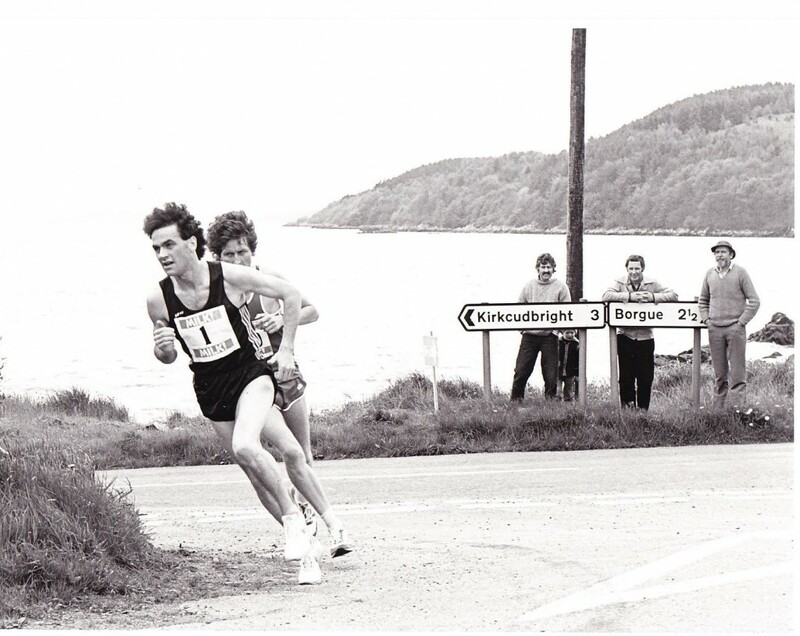 Just two days later, on the Tuesday evening, I found myself locked in an epic battle with Terry Mitchell in the Crieff Half Marathon, with him collapsing over the line four seconds in front of me in 63.42. (Terry, my apologies for my ungracious behaviour after the race when I took you to task for not sharing the pace. I could be a bit of a p***k in the heat of battle at times in those days). I had been obsessed with running a fast time while Terry was thinking of winning. What was our reward for such a tough duel over 13 miles on a hot summer’s evening? Terry won 12 shuttlecocks and I received six golf balls! Just four recovery days later, I was on the start line for the old Helensburgh Half Marathon course, a two lapper which involved twice making the climb up Sinclair Street. I was 100 metres or so clear at halfway, but looked around at 9 miles to see Dougie Frame of Law closing. He caught me by 11 miles and I hung on to him until the final mile when I chucked in the proverbial kitchen sink, determined not be beat by a close margin, as had happened at Crieff. I won by five seconds in 66.05. My prize was a medal. With the golf balls four days earlier, I remember thinking it was scant reward for two such tough races in five days. 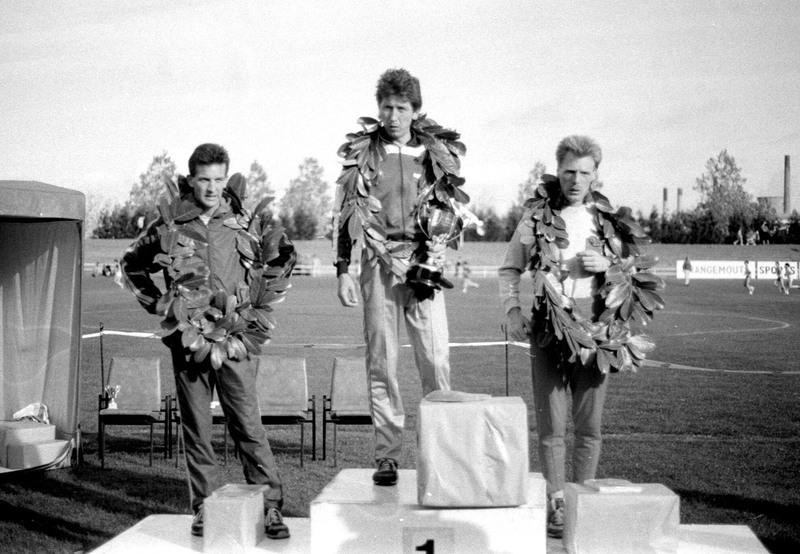 A week later I was at my beloved Strathallan Highland Games at Bridge of Allan (I was living there at the time) where I won the 3,000 metres handicap off scratch in 8.42 before finishing second in the 1500 handicap off scratch in 4.02 right behind my young clubmate Davie Donnet (off 35 metres). Three evenings after that, it was an 8.28 clocking for 3,000m at Coatbridge just behind Willie Nelson of Law. Just a further three days on, I was up at 4.30am, for the drive up to Elgin for the Moray Half Marathon. I beat Bruce Chinnick by more than a minute and set a course record of 66.09 which still stands today. The training diary says I was tired, and I did easy 40 minute and 30 minute recovery runs each day for four days and then a single easy run of five miles before winning the Blairgowrie Half Marathon by a minute from a German runner in 67.05. Just three days later, August 20, I was delighted to record 3.53 for a 1,500m at Meadowbank (Alistair Currie 3.46), barely three seconds slower than my pb. This was run on sheer condition, with no track work. (By this time my resting pulse before a weekend race was dropping to as low as 33 beats a minute). Four days on, I won the Midlothian Half Marathon in 67.20. Two days after, I did 12×400 with 40 secs recovery, and five days later, on August 31, I was on the start line for the Livingston Half. My running diary says it was undulating and quite windy, but I solo ran 64.41 to finish over a minute ahead of Dave Cavers of Teviotdale. A week of easy running later, I pushed the pace at the Land o Burns Half at Ayr (some hills, windy in parts), but was outstayed by Alex Gilmour of Cambuslang in the last mile, running 64.24 to his 64.02, with Dougie Frame third in 65.50 and Laurie Spence (didn’t beat him often) clocking 67.54. I then gave myself six days of easy recovering running, though totalling 11 to 14 miles in two runs most days, and it paid off in the Round Cumbrae ‘10’ starting in Millport. It was a complete circuit of the island, flat and the true distance was around 10.25/10.3 miles. There was no wind, making perfect running conditions, and I tore off from the gun. Immediately on my own, I only had the lead car and mile markers for company. By mile three or four miles, I realised I was hitting a perfect beat, clocking 4.43/44 for every mile. It became a target for me to try and maintain, and I managed it. I passed through nine miles in 42.30 and reckon I was around 47.15 at ’10 miles’ and crossed the line in 49.15, a record. What thrilled me most was seeing the previous record holders’ names engraved on the tiny trophy – John Graham 49.29 and Jim Brown 49.38. Clyde Valley’s finest, and big hitters (I had gone through my teenage years and early twenties hearing Brown spoken of with awe by other runners). They may not have had as benign conditions as I had, but it was now my record. Think it still stands. Second behind me was Cambuslang’s Charlie Thomson in 51.51, saying he felt he had a good run. The road show continued, and a week later, on September 22, I won a windy Aberfeldy Half Marathon in 67.39, ahead of Falkirk’s Martin Coyle, 68.23. However, the first cracks were beginning to show. The diary reveals I was tired all week and six days after Aberfeldy I dropped out of the Livingston 6-mile road race, ‘weary’ at four miles. Allister Hutton won just ahead of John Robson. Not for the first time, I had failed to show my best when up against the big guns. The following week showed I was very tired. I just jogged a little and even took two days off, but on Sunday, October 5, I won the Stranraer Half in 66.02 but felt the course was short. I gave myself two weeks, including a week away on holiday up north with the wife, before picking up the Fort William Half Marathon on the way home. On a cold, wet and windy day, I ran in training shoes determined to do just enough to win in 69.06. There was just one more week to go for my last half of an incredible year, at Falkirk on October 26. I took an early lead only to be caught by Donnie Bain at around 9 miles. However, he didn’t manage to open a gap, and with a mile to go I gave it everything I had. I was tired and mentally spent from all the racing, but I really liked the idea of winning 13 races at 13 miles in one year. I got a bit of a gap and hung on to win by ten seconds in 66.45. A week later I won the Lasswade cross country, six days later was sixth (25.06) in the Glasgow Uni five mile won by Nat Muir in 24.18, and eight days later I ran the fastest leg in the second stage of the Edinburgh to Glasgow relay. Just six days on from that, I was a weary third behind Terry Mitchell in the Gauldry cross country. I think that last burst of shorter races after Falkirk was act of defiance against the stories I was hearing. People were saying that after that crazy sequence of halfs and other races that I would be burnt out and possibly never run well again. Anyway, after Gauldry I was indeed well and truly done – for the year. Other proud running memories? My relay team races with Springburn. Like many distance runners I was a fairly selfish athlete, however a good relay race could really arouse my passion. Three times in four years, we finished second in the Scottish cross country relays, and on the other occasion were third. We never quite got our best four of Adrian Callan, George Braidwood, David Donnet and me all firing on the same day. However, we were formidable opponents. Emphatically winning the west district cross country relay with Adrian, George and Jim Cooper was a happy day for us all, as was when we unexpectedly won the six-stage road relay at Livingston. I nearly blew that for the team and would never have lived it down. I somehow had got it into my head that the race was at Strathclyde Park where it had been before. On arrival at the park, I became increasingly uneasy at the complete lack of runners until the penny dropped that perhaps I was in the wrong place. I called Adrian’s parents and they directed me to Livingston. I drove as fast as I could, however Livingston is a big town and I could see no sign of runners there either. Spotting a police car I waved for it to stop and asked for help. They said ‘follow us’. Eight minutes later I was at the far end of the town where the race was already under way. I had five minutes to get my number on and jog to the start of my second leg. Yes, it was that close. Another proud achievement was winning the Jimmy Flockart Memorial cross country at Drumpellier Park three times. The third time, I was 35 years old and not expected to beat the young, up and coming Stephen Wylie of Cambuslang. I remember Doug Gillon of the Glasgow Herald giving me a nice write-up for that. I was also pleased of my achievements at Strathallan Highland Games, especially since I lived in Bridge of Allan for four years. I won the 3,000 handicap six times and the 1,500 handicap four times, and in the early years they involved pretty fast times for a grass track against good runners. I loved the highland games and would often run two or three races in a day, which helped my clock up those 50 races in 14 weeks. I guess my view was ‘when you are fit, make hay’. I might have messed up at times with that approach, but it was who I was. I loved racing, and loved winning. I also liked having somewhere to go at the weekend, and better still if it was a race I had not tackled before. I had no qualms about getting in the car and driving up to Elgin or down to Stranraer. It kept the spark alive, as did my ever-evolving training regimes. I trained twice a day most days, but broke up the tedium of always running by mixing in circuits and weights at times, both of which I think helped me. Over the years I did land training with swimmers, and circuits with wrestlers, boxers and cyclists. I believed I made the most of my limited pace, with the weights, circuits, hill work and lots of intervals and track racing. I was 29 years old before I ran my first half marathon. Too many young runners move up distance too soon these days, and don’t run enough track in the summer. I can be a real bore about that. There is no point me giving a typical week’s training, because I’m not sure there was such a thing for me. I experimented a lot, did too much at times and generally trained hard. I don’t think it is the detail that counts, it is the essence – consistent hard training in whatever shape or form helps you. Also keeping the spark, the desire – there are many ways to climb a mountain. 3x4x400 on cinders with spikes in 62 secs, with 30secs recovery and a lap between sets was a session which served me well at peak fitness for 1,500s and 3,000s (a distance I really enjoyed) at the start of the track season. When I was fit, 8x2mins very fast on the road with 30secs recovery was another key session. Recoveries were generally pretty short. Another memorable training period saw me doing 2min spells on the road during a 16-18 mile run. I started once a week doing about 10x2mins with 2min recoveries. Not too hard, just letting it come naturally. Each week I added on two more reps and eventually also cut the recovery. Eventually I was doing 26x2mins with one minute recovery and it felt boundless. I was getting so strong on it – and faster. As a variation, I did 10x2mins with 1min recovery and then straight into 10x1min faster with 30secs recovery and then straight in 10x30secs very fast with 30secs recovery. It felt marvellous to be able to do that and still be in one piece. A good session was as satisfying as a good race to me. When I trained around the streets of Bishopbriggs and Glasgow on my own as a teenager in winter nights, I use to fantasise over the last few miles that I was on my way to winning an Olympic or European marathon goal. Funnily, I never did run my dream event. The half marathons I did suggested a potential for the full distance, but they also served to inform me how hard it would be to do a second 13 miles. I knew, knowing my nature, that it would have be pretty near to my half marathon pace, and because of health and injury problems I never did get the continuity of training that I knew would be necessarily to show the marathon its full respect. Regrets? Not one. It is how the movie unfolded, but I agree with John Graham when he observed that if he was to do it again he would have been a little kinder to himself at times. I’m deeply impressed and grateful for the compilation Brian McAusland and Colin Youngson have put together of so many of Scotland’s finest middle and distance runners, many whom have inspired me and achieved far much more. I am a running fan. Reading the stories reminds of how many good runners we had in my generation alone. Thanks guys, for the races and the memories. I’m humbled and honoured to have this opportunity to tell some of my own wee stories as well. Hopefully, 1986 at least was quirky enough to be of interest. It just happened. I just went along, fascinated, for the ride. And that’s where Graham’s own amazing story ends but we can’t leave it there. He is still running as a V50 and as I write (March 2013) he has just been first in his category at the Jack Crawford Memorial 10K promoted by his own club, Springburn Harriers. As an indication of his quality over the past few years, the Power of 10 website, while not comprehensive, gives a picture shown in the table below. No comment of mine is required about the standard but it is always a source of inspiration to see man who is a lifelong runner and clearly enjoys the sport for its own sake. That was the third stage but generally Graham seemed to specialise in running the second stage – my feeling is that the second stage needs a fighter and a hard competitive spirit – just in case the first runner has a poor one, or in case ground has to be made up, or in case a lead has to be maintained, and in any of these situations there is no more competitive runner than Mr Crawford. In the winning West District Relay Team. It is maybe appropriate to take a look at some of Graham’s running on track and over the country a bit more closely. As far as track running is concerned, his record on all surfaces is good – grass at Highland Gatherings, cinder on occasion and tartan in others all came the same to him. He progressed quite rapidly in the early 1980’s. Have a look at the table below: every year in every event was faster than the year before with the single blip at 3000m in 1985! The British vest referred to above was won in January of 1987 and it was reported in “Scotland’s Runner” as follows under the headline “Ups and Downs of Holland.” “When Springburn Harrier Graham Crawford discovered on his arrival at Amsterdam Airport on January 11th that his first race for Great Britain would be run over frozen sand dunes and beaches, he quickly forgot any idea of a fast time on the flats of Holland. And when temperatures on race day plummeted to minus 13 degrees C, and were worsened by a chill wind straight off the Russian continent, the 18th International Egmond Ann Zee Half Marathon simply became a matter for survival. “The winner of the inaugural Sun Life Great Race was Paulo Catarino of Portugal who collected prize money of £35,000 for his not inconsiderable efforts. Twenty six year old Catarino completed the 230 mile, 20 stage race in the incredible time of 18-32-43. Consistency was the key to the event, illustrated by the fact that Catarino did not win a single stage over the three weeks of the race. The deciding factor in his triumph was that he did not finish any lower than eighth on any given day. Delmir dos Santos, the 24 year old Brazilian running for the American Boulder Road Runners Club took the green vest for the overall points winner. His colossal total of ten stage victories ensured his success. The first four stages of the race were dominated by 43 year old Kenyan, Kipsubei Kisgei if not always for the right reasons! Although he won all three Scottish legs, he self destructed when he was seen to strike dos Santos on the fourth stage from Gretna to Carlisle. The starting field numbered 107 when the race got under way in Glasgow on September 2nd. By the day of the final Westminster stage, only 82 runners remained. Many of the ‘big’ names withdrew or failed to finish including Mike McLeod, John Graham, Fraser Clyne (who was supposed to write a diary of the event for ‘Scotland’s Runner’), Steve Brace, Gary Kiernan and Dave Moorcroft. In the team contest, the lead changed hands many times before the Boulder outfit took the title. Hammy Cox, representing Red Counties AC, finished 18th, the highest placed Scot and the third Briton. Brian Kirkwood, UK Elite, ended 38th with Graham Crawford, Wolverhampton & Bilston, finishing in a highly creditable 58th, after entering the event at the last minute. After recovering, Graham said, “It was a first class event which was highly professional in its organisation – especially considering that this was the first event of its kind. The word most used by competitors when describing the event was ‘fascinating.’ Both your own performance and the changes of position up front made it constantly interesting,” he said. With the bulk of the race being run at a phenomenal sub-5 minute-mile pace it was not surprising that many athletes didn’t last the pace. However Graham found that despite the rigours, the most common reason for withdrawing was bad blisters. “The race proved that many runners under-estimate their powers of recovery,” commented Graham Crawford. As for his personal performance, Crawford was more than delighted. “I didn’t intend to run but as it got nearer, I was bitten by the bug and it was a case of ‘what the hell’ in the end. The Springburn Harrier’s worst moments occurred – ironically – in the Scottish stages. “By stage four (Gretna to Carlisle) I was unsure whether I would last one mile, never mind the 12.8!” he says. Finally, although the publicity he generated for his club was invaluable and stretched over decades, he was on one occasion in hot water with Springburn Harriers. In 1991 the result of the Brampton to Carlisle road race which was won by Carl Thackray, had David Donnet of Springburn second, Mike Carroll of Annan third and Graham Crawford fourth. There was no third runner from the club so there was no team prize. Why was there no third runner? Well, the race was held in the same weekend as the prestigious Edinburgh to Glasgow Relay and the club was none too pleased at two of their top three or four runners absenting themselves. He also represented Scotland in a home international cross country at Cumbernauld, and in several similar or televised invitational events at Gateshead, along with appearances in such events as the Inter-Area match at Cumbernauld. The cross-country talent was always in evidence. Graham wrote a piece for the excellent ‘Scotland’s Runner’ magazine which I will reproduce in its entirety here because of the insight it gives into his beginnings in the sport. “In the beginning, there was cross-country. A harrier was measured by his ability in an event in which time and distance were only relevant in relation to those around him. Nobody started and stopped sports watches. 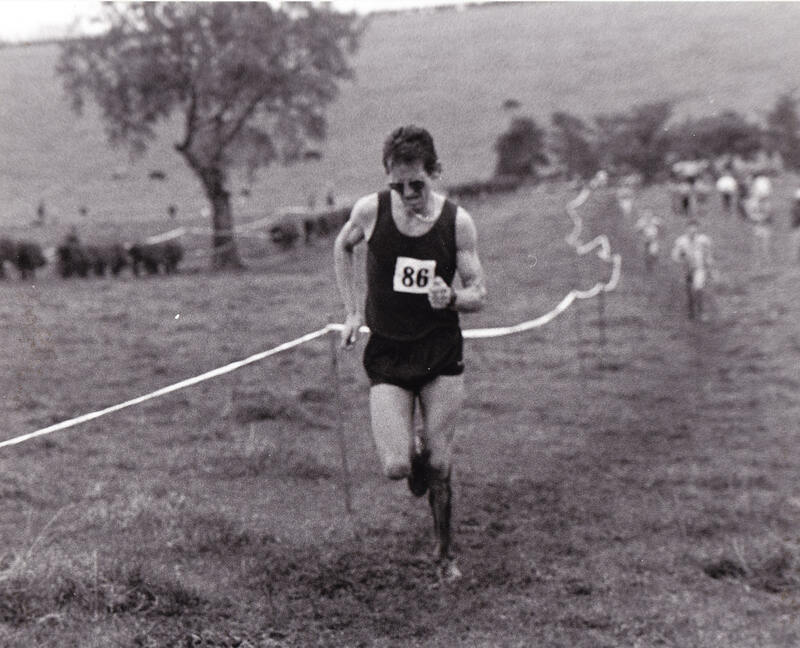 To me as a youngster cross-country was the be all and end all. I was the complete opposite to today’s ‘fair weather’ new runner. My season began with the return to school in August/September, peaked with the main championships in February/March, and fizzled out rapidly thereafter with the advent of Spring and its uncanny ability to convince a young lad that, in girls, there is definitely more to life than being left battered to death by hailstones, semi naked, in the middle of a farmer’s field. Still, come Autumn, off you would trot again into the wet and windy nights, undaunted and with fresh dreams, aims, targets and schedules. The call of the wild perhaps. You certainly always returned for more, and particular races could operate a pull of their own – despite all logic. enough to take a Hogmanay hangover with me. Ayrshire has always been good for cross-country races on the most heart-breaking of winter days, and Stewarton is another legend. I have vivid memories of big lassies and wee lassies in their early teens come staggering down the street (true, a cross-country race that finished in the street) with bare feet, or only one loose sock with a ball of mud flapping on the end, and collapsing, sobbing, into their mother’s arms. (They weren’t so well prepared in those days – the late Sixties – and come to think of it, it was the biggest lassies that made the biggest fuss. Still, nearly every competitor had marvellous fun going back into the fields afterwards to find the shoes schlupped off in the mud. Lanarkshire’s greatest course, sadly no longer in use, was at Cleland. Heavy, heavy going, a mighty hill and enough barbed-wire fences to have every man counting “one – two” as he crossed the line. Ah, the memories, it’s no wonder I can’t understand new runners reeling back in horror when I suggest a wee diversion off the tarmac during a training run. Just across a few fields so I can smell the mud and the grass again. “WHAAAT? What about the nettles? There’s a barbed wire fence. And a burn. Geez, what about the farmer?” they wail. Lachie Stewart won the Stewarton race in 1968, 1969 and then made it a hat-trick in 1970, after winning the Commonwealth Games 10000 metres. And his son Glen, who is showing the same kind of talent, will probably be there this year. So join a club, get to know the races (some can be well-kept secrets but at least there are now hot showers afterwards), and there will be more than enough satisfaction, fun and fascination to get you the door with the rest of us on the cold wet and windy nights. The article appeared in the October, 1986, issue of the magazine and was written in conjunction with an article on Nat Muir. It is quite a powerful statement of the attractions of the sport but also indicates the depths of the love Graham has for all kinds of endurance running. The Springburn Harriers young athletes were mainly coached by Eddie Sinclair, himself a cross-country internationalist in the 1950’s and their boy’s senior boys, youth and junior teams all did very well and were among the best in Scotland, winning medals and titles at County, District and National level as well as in regular open races such as those at Bellahouston Park. The table below give some indication of this success in the National Championship for Graham’s teams. 1975/76 Junior 8th T Patterson 10th, G Crawford 20th, J Fleming 42nd. Fourth runner and position unknown. As he himself says above, in season 1973/74 when they won the team title, the club realised that Jim Lawson who had been a member of the Junior team was, because of the English age groupings, eligible to run with the Youths team. The club decided to send an Under 17 team to the English Cross-County Championships. The team went down to the race and, despite running below their best, came home with the silver medals which should have been a source of great pride. This was not the case however since they felt they had not performed to their ability. 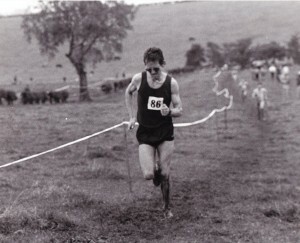 Graham’s best run in the senior national was in 1983 when he led the club home in eighth position. This led to his selection to run for Scotland in the International Amateur Athletic Federation championship which that year was held in Gateshead. He finished in 182nd and was a scoring Scottish runner. And finally, if you want more on 1986, have a look at “Scotland’s Runner” for November 1986: his own look back is on pages 44 and 45, while Colin Shields makes some percipient observations on page 43. The magazine is online at http://salroadrunningandcrosscountrymedalists.co.uk/Archive/Scotland’s%20Runner/SR%20No%205.pdf . Even so, it might not be appreciated how hard he worked himself in 1986: the sheer scale of the feat can be seen if we set the results out in tabular form. (* means course record time). In case you were wondering, Graham’s track statistics for the next few years are noted in the table below. The report of the Clydebank Half Marathon the next week was so scanty that it only reported down to third finisher. There was a shortage of results in the ‘Herald’ during the Commonwealth Games in 1986 which enjoyed mammoth coverage, with the European Championships a month later also getting some good coverage. But it was not long before the scribes there cottoned on to his continuing successes. Some more reports. “Graham Crawford of Springburn Harriers won the Goretex Fabrics Half-Marathon at Howdden Park, Livingston, his fourth victory in three weeks. He set a course record of 66:41 and won by 300 yards from Denis Cavers (Teviotdale). [I think he meant David Cavers!] 1/9/86. “Graham Crawford (Springburn Harriers) brought his road running season to a triumphant close on Cumbrae when he beat John Graham’s course record for the 10.25 mile road race by 13 seconds. Crawford’s time was 49:15.” 15/9/86. It was a mad racing programme that no half sensible coach, exercise physiologist or sports scientist would have organised or recommended. If a summer like that can lead to a fastest time on the torrid second stage of the Edinburgh to Glasgow, maybe more runners should have tried it. It was a wonderful year and superb display of fitness, speed and, of course, enthusiasm. It is also a year that Graham can look back on with pride. In fact he can look back on his whole running career with considerable pride in his achievements and his many successes over many surfaces and in all weathers. One international vest in any endurance discipline would please most athletes – to gain international recognition on the track, on the roads and over the country takes remarkable talent. And through it all his enjoyment shines through – too many of our top runners can’t wait to get out of the sport as soon as they have, in Emmet Farrell’s phrase, “shed their silk”. I suspect that Graham will be running for a long time yet.